Wildscapes Workshop, a one-day, not-to-be-missed educational event and local native plant sale, is back after taking a year off due to Hurricane Harvey. This year’s 20th anniversary event will involve four featured speakers in an effort to provide up-to-date information on the relationship between native plants and our local wildlife and environment, and Houston’s prairie history, culture, and its future. Join us while we restore a portion of the endangered Coastal Prairie and Wetlands ecosystem. We will plant a variety of native grasses and forbs that will benefit both wildlife and people alike! Be sure to bring water, boots/old shoes, and clothes to get dirty. Hummingbirds are astonishing creatures. They are delicate and beautiful, but they are also tough and incredibly aggressive. They live on the edge of possibility, hearts beating 1,200 times per minute, barely able to survive a cold night – yet they can fly across an ocean in one trip. In this class we’ll learn all about hummingbirds and hopefully get to see some stopping over on their fall migration. 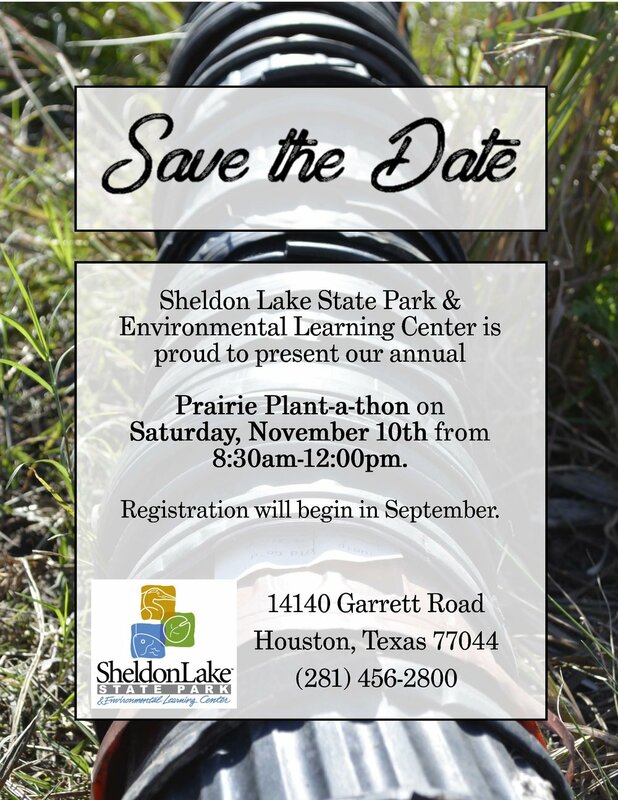 Join Houston Parks & Recreation Department for a prairie planting in a city park! Enjoy a walk among fall blooms or help with a hands-on bioblitz at HNPAT's Lawther - Deer Park Prairie Preserve. Where/When: 2:00 pm at the LaPorte Library, 600 S. Broadway St., LaPorte, TX 77571. Free. A virtual field trip from the award-winning MD Anderson Prairie in Houston for students and adults. October is one of the best months for viewing wildflowers at the Arboretum, and it’s also a perfect time to plant seeds for next spring. Join us for a wildflower walk to see what’s blooming in our pocket prairie, and learn what species might be good for your home garden. In the classroom, you’ll learn how to identify some of the major groups of wildflowers here in Houston, and you’ll even get some native flower seeds to take home. The first Saturday of each month, a guided van tour of the refuge will take visitors on a two-hour trip through the prairie. Join refuge volunteers and staff to learn about native coastal prairie, the history of the refuge, the biology of the Attwater’s prairie-chicken, and what’s being done to save it from extinction. Come join the Texas Land Conservancy, Sierra Club, and others as we work to maintain the only restored Tallgrass Prairie in the Big Thicket. Full slate of monarch related activities, plant sale, pumpkin patch, and more! Mercer's inaugural Pollinator Festival is a free community event and perfect for festival visitors of all ages! Find great nectar and pollinator host plants, as well as Texas native plants at the Pollinator Plant Sale. Visitors are invited to dress in bee, butterfly, bat, hummingbird, or flower attire! Bring the kids for face painting and lawn games while welcoming the autumn season at Mercer. Work on your bird watching skills while helping the Arboretum monitor bird populations on a fun, relaxed morning walk. Join us on the second Saturday of each month at the front door of the building for a two-hour bird walk led by Kelsey Low, resident bird enthusiast. We welcome all levels of bird watching skill and all ages (as long as you’re quiet) – but no dogs, please! If you have binoculars of your own, please bring them. We do have some binoculars available to borrow. Monarch butterflies captivate us with their beauty and incredible endurance, but despite their popularity, monarch populations are in serious decline. In this class, you’ll learn about their complex relationship to milkweed, their multi-generational migration, and what you can do to help monarchs at home and on a global scale. We’ll even give you some native wildflower seeds to plant at home. Join ABNC for the original public prairie planting. Each year volunteers restore the prairie at ABNC by planting thousands of prairie natives. You will be guided by some of the most knowledgeable and friendly staff and volunteers in the region. Join environmentalist Brandt Mannchen on a tour of the little known and colorful Blackland Prairies just north of Houston. 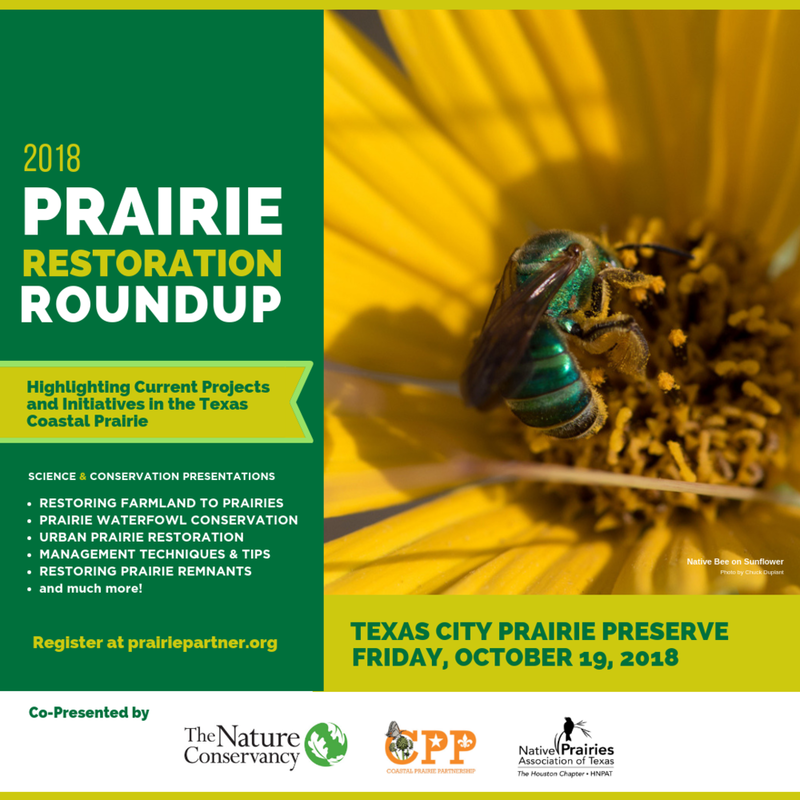 Join Jaime González, of the Coastal Prairie Partnership, on an inner city adventure as we visit several current and future urban pocket prairies in the heart of the city - including the Texas Medical Center and Rice University. We'll travel between stops by METRO light rail. Hiking is required for this field trip. Join Houston Parks & Recreation Department to help remove damaging invasive species! Join the Texas Master Naturalists - Coastal Prairie Chapter for an exciting day of activities, speakers, wagon rides, and hikes celebrating our native prairies. Join Rice University to help restore an on campus pocket prairie. Help the Katy Prairie Conservancy Put Down Roots during KPC's largest restoration effort yet! Volunteers will work together to transplant native prairie plants in order to restore 55 acres of newly reconstructed prairie habitat. Lunch, snacks, and door prizes will be provided, but feel free to bring your own food if you have dietary restrictions. Spend the morning getting your hands dirty by planting native grasses and wildflowers. Volunteer to be a part of our ongoing project to restore over 400 acres of beautiful native prairie habitat! This is a great event for all age groups, interests, and abilities.